As sweet as cinnamon: Snowflakes! Snowflakes were at our house today! the special little person will get this in the mail next week..
Hope your having a wonderful week. Christmas advent ideas over here! Que lindo las niñas trabajando...!! Love your snowflakes and your christmas cards look great. 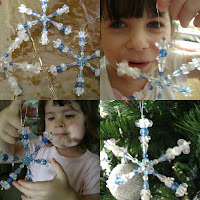 My girls and I really enjoy making christmas decorations and bits and pieces in the lead up to christmas. 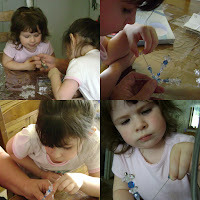 Hi Dawn, The girls look like they are having so much fun making those lovely snowflakes and tell them the cards look wonderful. You are having so much fun. Awww, look at those gawjus girls deep in concentration!!! Soooo cute!!! Your snowflakes all turned out beautiful!!!! It looks like you and the girls were very busy. The little beaded stars look good and well done on the chrissy cards. Your post took me on a trip down memory lane :>) I loved doing Christmas crafts with both the children and, in fact, many of the pretty things they made still make guest appearances on the tree every year. I love those little gingerbread house cards too...look, my name begins with an R!! Thank you SO much for the beautiful snowflake ornament, and for my little dolly and pretty card! Thank you SO much! I think you are great at making things, and great at sticking and drawing too! Those Snowflakes are adorable and your daughters look like they're having fun. Lovely cards also.